As a blogger I am always really thrilled to be able to bring my awesome readers unique inspiration and the inside scoop on fabulous opportunities. That said, today I am so excited to tell you about the most incredible giveaway! American Express and Starwood Hotels and Resorts are giving one lucky The Sweetest Occasion reader 100,000 Starpoints redeemable at any of the Starwood properties to plan the vacation of your dreams! (Insert some pretty serious squeals of joy over here.) I am an absolute travel fanatic so the opportunity to share that experience with you is killing me with glee right now! Wondering how to win? It’s simple! 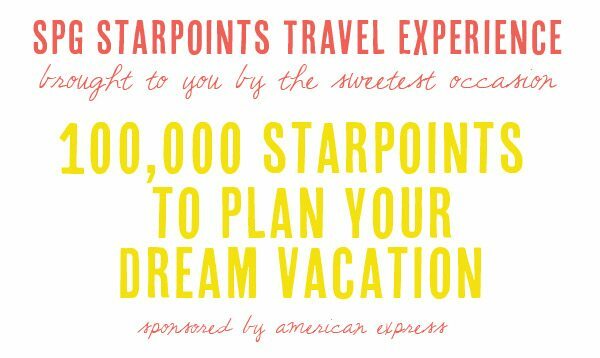 American Express and Starwood are also giving me 100,000 Starpoints to take my own dream vacation and I’d love your input on where to go, what to see, where to eat and what to do. Have a favorite restaurant in Montreal or beloved memories of a ski resort in the Rockies? Tell me all about it! Comment here with your travel inspiration for my upcoming trip between now and Monday, August 22nd at 9am EST and one lucky winner will be announced that day! But the awesome doesn’t stop there! Between now and August 22nd American Express will be running a promotion providing new Starwood Preferred Guest Cardmembers with up to 30,000 in Starpoints (10,000 at First Purchase and 20,000 more by spending $4,500 in 3 months). The limited time offer also includes $0 introductory annual fee for the first year. So basically, if you’re a travel junkie like me and you want to plan a killer trip, apply for the Starwood Preferred Guest card, charge up the batteries for your camera and start making memories! I’ve also heard the most amazing things about San Antonio lately where the Sheraton Gunter Hotel looks right up my alley. I already know I could get lost for hours exploring the River Walk and the Alamo. That said, I think I have my heart set on jetting off to the Sunset Key Guest Cottages, a Westin resort in Key West. I mean, it’s Key West! After a really busy, life-changing summer I’m thinking long lazy days of sunshine, icy cocktails and the slow pace of island life are just what I need. This post was sponsored by American Express.